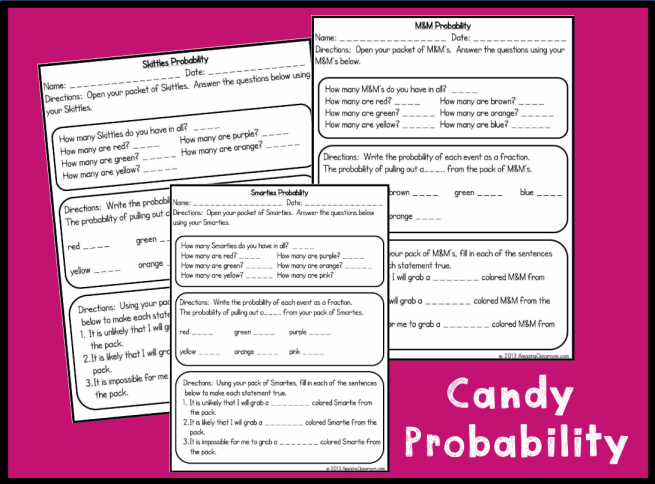 This file includes three candy probability activities to do with your students. Snack size packs of M&M's, Skittles, and small rolls of Smarties will be needed prior to using this activity with your students. The activity focuses on how likely, unlikely, and/or impossible it is for your students to pull out a given color from their pack of candies. Your students will also write the probability as a fraction of each event. Enjoy! This Standards Management System for 2nd Grade Math is the perfect companion for any teacher. 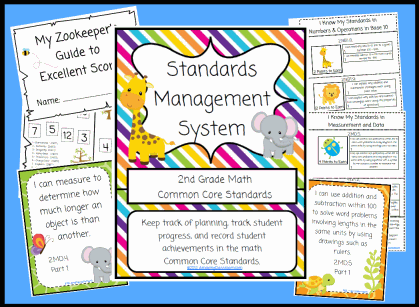 It includes over 130 pages of: student friendly objective posters for EVERY 2nd grade math standard, teacher planning pages, student folder contents for students and teacher to keep track of all of the standards they have mastered, an incentive "Zookeeper's Guide" program where students earn award badges for mastering the 2nd grade math standards. Enjoy! 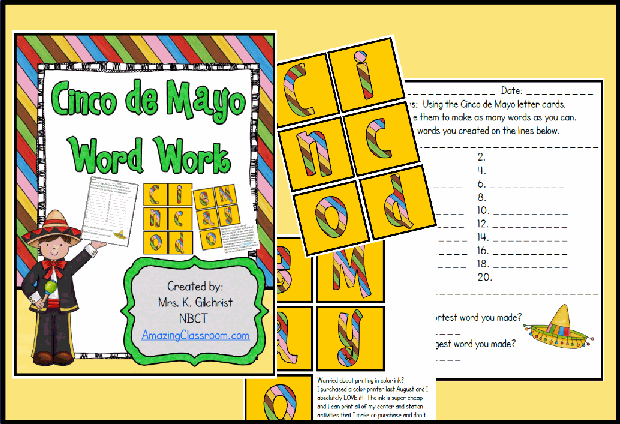 Your students will have fun with this Cinco de Mayo themed word work activity. The students will use the Cinco de Mayo word cards to make as many real words as possible. The students then record the words they found as well as the smallest and largest words they created. This printable includes an individual alphabet set to print out and laminate for each student as well as a matching wall set. 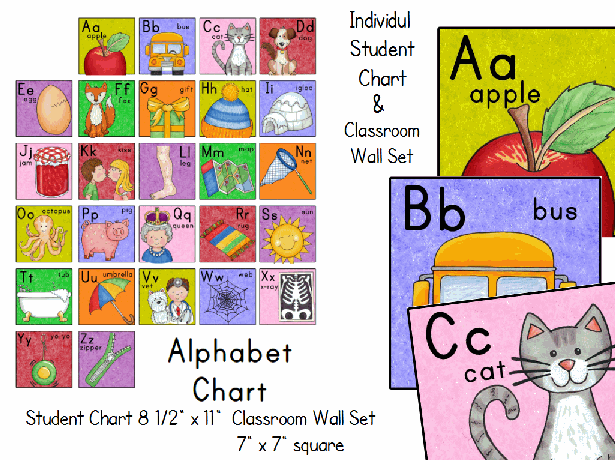 Each student alphabet set fits on a portrait sized 8 1/2" x 11" sheet of paper and prints nicely. Each square image for the wall measures 7" x 7" square and beautiful alphabet images from Kate Hadfield Designs. Just print and laminate for better durability. Enjoy! 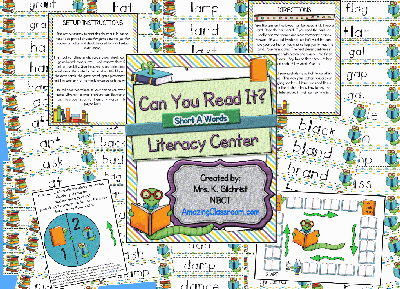 This can you read it game features 125 short a word cards. The students draw a card, read it, spin the spinner, and move on the game board towards finish. If the student didn't read the word fluently, its the next player's turn. Choose a few cards to use, or all of the cards. Some are easier words like at and has and others are more difficult like master and sang. This game includes a cover page, directions, cards, spinner, and game board. 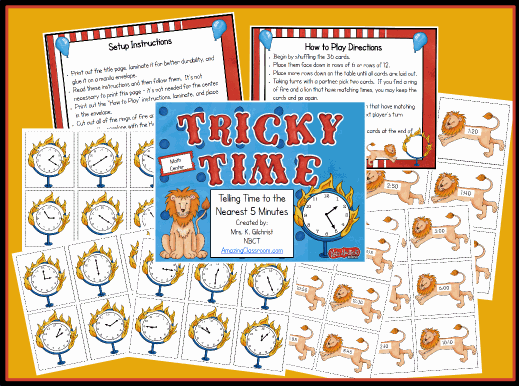 Your students will love learning "Tricky Time" with this telling time to the nearest five minutes math center station activity. This game is played like memory. The students have to match the analog time (the ring of fire) with the digital time (the lion jumping) to make matches. 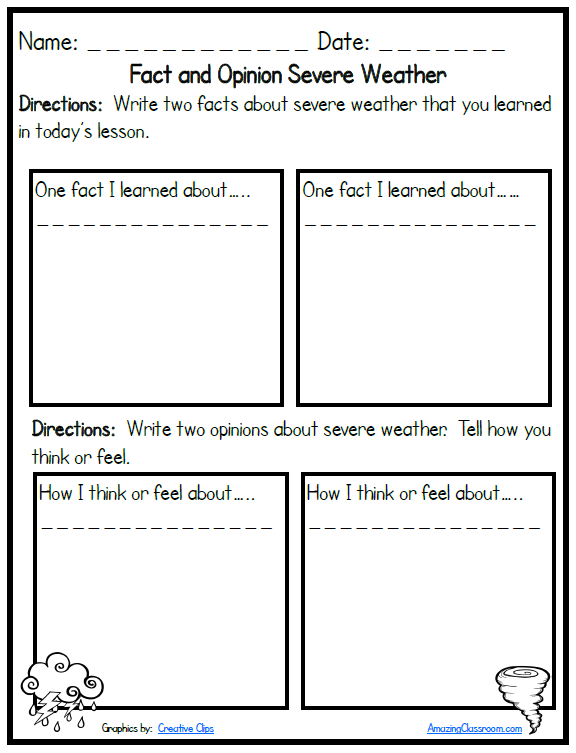 This cute center using Kate Hadfield's designs, is sure to make learning tricky time fun for your students. Enjoy! 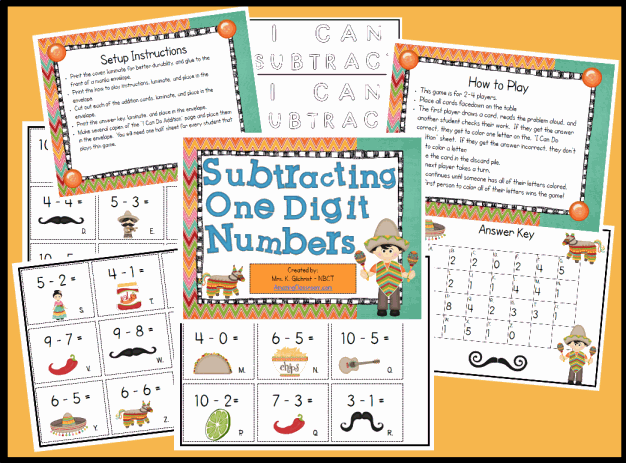 Your students will have fun learning how to subtract one digit numbers with this fun math center game! This fiesta themed game includes a cover for a manila envelope, how to play instruction, setup instructions, 26 game cards, an answer key, and an I Can Subtract recording sheet. Enjoy! 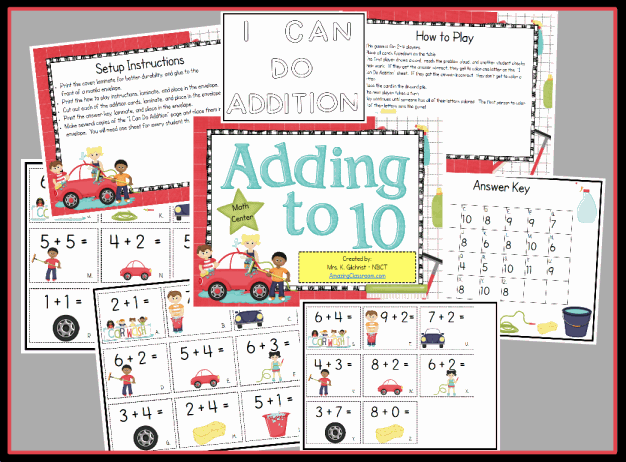 This Adding to 10 math center is perfect for your little cuties! They will love playing this game, as well as the second benefit of learning their addition facts. This center game comes with a cover for a manila envelope, setup instructions, how to play instructions, 26 addition cards, an answer key, and an "I Can Do Addition" color sheet. Enjoy! 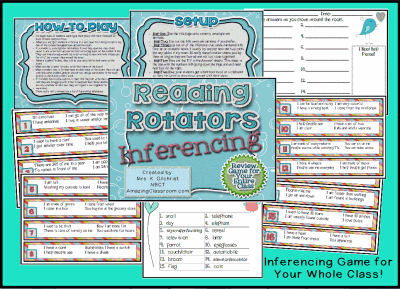 This Reading Rotators Inferencing Game is great for whole class review of this skill. This game is played exactly like our math movers games only this is the ELA version. This file includes a title page for a manila envelope, setup instructions, how to play directions, 16 inferring clue cards, a fill in the answer page, and an answer key. Your students will love trying to infer the clues in this fun, whole class, review game! Enjoy!